This year marks the fiftieth anniversary of the Freedom Riders and their brave journey through the South fighting for the rights of Blacks. From the right to sit at the same counters as Whites in department store eating establishments to testing the federal mandate that segregation is illegal for interstate travel, there were many injustices to be challenged. They faced violence with the philosophy of non-violence. Members of this group were beaten, spat upon and the bus they rode was set on fire in a town in Alabama. But still, they kept going. When they arrived in Mississippi, they were immediately arrested and sent to Parchmen, the state’s penitentiary. While the governor thought that would stop the flow of activists, it opened up the floodgates. 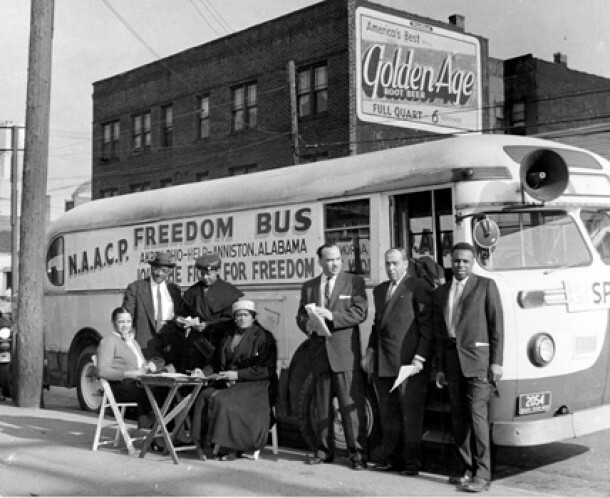 More and more students and young adults came on buses till the point where over 200 were in jail, sending the message that even incarceration cannot stem the fight for racial equality. The role that Christianity played in the Civil Rights Movement was more than just keeping the spirit alive. Churches served as meeting places where songs of freedom accompanied fiery speeches for rights denied invigorated the movement. Christians, White and Black stood up for what they believed in, putting in practice the life of Christ in their world. They did not stand on the sidelines in their safe places, waiting for someone else to make the changes necessary for justice in this world. As dangerous as the men who lashed in violence against the Freedom Riders, there were some just as dangerous: those indifferent to the cause. In this country, at this moment, it is easy to be a Christian standing indifferent on the sidelines in a comfortable faith. We have the ability to go to services and go home, turn on the TV and ignore the injustices here and around the world. In the Baptismal Covenant of the Book of Common Prayer, there is a question, a mandate asked of all who seek to be baptized, “Will you strive for justice and peace among all people, and respect the dignity of every human being?” It is ingrained in our Christian faith to be active in our duty to uphold justice. If we take our faith seriously and follow the scriptures, then there should be no hesitation to stand up for our brothers and sisters who are suffering. Martin Luther King Jr. wrote in his famous Letter from Birmingham Jail that, “Injustice anywhere is a threat to justice everywhere. We are caught in an inescapable network of mutuality, tied in a single garment of destiny. Whatever affects one directly, affects all indirectly.” We have the duty to make this world more like the kingdom of heaven and a big part of that is helping others who are oppressed. Yes, it sometimes will make us uncomfortable. Yes, it can be emotionally taxing. Yes, it will take time and dedication. But being a Christian doesn’t always mean being comfortable. It’s a life of thinking and acting outside the box. Margaret Blount Montgomery is a young adult living in Oxford, Mississippi where she reflects on life, Christianity and being 25 in a world (and church) that is not so open to hearing her thoughts.